Chelsea fans weren’t best pleased with Jorginho for this particular moment in their 6-0 defeat to Manchester City on Sunday evening. The Blues were absolutely thumped by Pep Guardiola’s side at the Etihad, as they returned to the top of the league following their win over the west London side. No Chelsea player had an outstanding game, with one player in particular, Jorginho, having an afternoon to forget. One moment in particular from Jorginho which fans weren’t best pleased with came in the second half, as the Italian made a sloppy, lazy attempt to track back and defend whilst Man City were charging towards goal. You can check out the moment below, as well as what fans had to say on the matter. Looked like he’d pulled his hammy and was slowing down to fall over! 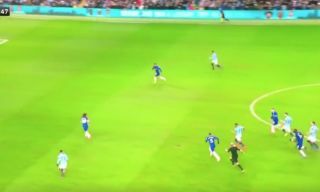 That attack just now where Jorginho jogged as Raheem Sterling sprinted past him summed up the whole game. Did you all see how Rudiger misjudged the Sterling run and how the same player easily got passed Jorginho? Mate see how Sterling just waltzed away from Jorginho.